There's always a need for a serving table on a patio. Just as there are different console or buffet styles for inside use, there is a wide selection just for outdoor use on a patio. Decide how you like to serve guests and then choose the best style for your existing patio décor. A bottom shelf on a food and beverage table can be a lifesaver for holding coolers or buckets with drinks, extra dinnerware and glassware. This Stratford Wicker 2-Tier Buffet Table has two shelves for food and drink. Made of all-weather resin wicker with a rust-resistant steel frame, this table is ready to serve. Customer reveiws: "Stunning table, well built", "Looks like you paid 400 dollars for it! ", "Very solid product. Well built. Not lightweight." and "Used it for a few weeks, we liked it and decided to buy another." Place this table in a shaded area or underneath a patio umbrella. Set a tall potted plant, such as a palm or Bird of Paradise on one or both ends to frame the station. Suspend two colorful paper lantern lights above to further highlight. If you prefer strings of light can be hung overhead. The Chatham Ultimate Console Table is made from mahogany and eucalyptus that's sustainably harvested. The table features a built-in towel rack, basin for ice and drinks and a bottom open shelf. The table can be leveled on uneven surfaces by using adjustable levelers. Make this the centerpiece for your patio celebration. Fill the well with ice and drinks and use the rest of the tabletop for serving foods and holding glassware. Place where it's easily accessible and out of the sun. This Eucalyptus Console Table features long slat top and bottom shelves. Set party munchies on the tops shelve and buckets of ice and drinks on the bottom shelf. The table is available in a natural oil finish that can be left to naturally age will turn into a soft gray, espresso or walnut finish. Customer reviews: "Love the look. ", "Perfect for entertaining outdoors. ", "The console was perfect, and just as expected." and "Assembly was a cinch, and it looks great!" This table can be used as a standalone drink and food server. Set a potted plant or flowers on the bottom shelf. Drape a table runner over the console to bring a festive look to your buffet of food and drink. 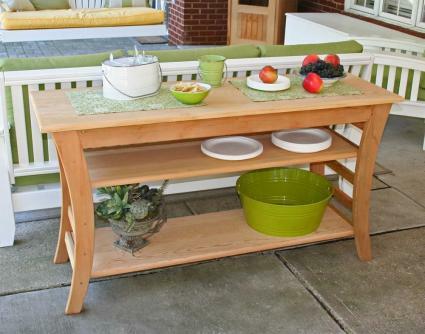 The Creekvine Designs Cedar Entertaining Buffet Table is a great size for throwing a patio party. The design features curved sides. Made of Western red cedar, the table has a natural finish. The table boasts two lower shelves, offering lots of space for storing and holding baskets/coolers of drinks. Customer reviews: Customers are pleased with the table. Some of the comments include, "Sturdy, nice-looking table." And "Looks great and works well." Use this table with almost any decor style. The curved designed gives this table a special appeal that fits with Asian furniture lines and many Modern styles. Don't be afraid to use this type of furniture design with contemporary pieces, too. Select one or two pieces of curved outdoor art to set on the table when not being used to serve food or as a centerpiece for a party decoration. Cooler tables are a great way to serve food and drink by offering the convenience of having everything centrally located in one place. This Keter Pacific Cool Bar Rattan Party Cooler is multi-functional as a cooler, cocktail and pub table. Use the cooler for drinks while serving food on the tabletop. The table height is adjustable to be used only as a cocktail table or serving table. When raised to pub height and locked in place, the base reveals the drink cooler. Melted ice can be easily drained by released the bottom plug. Cooler beverage capacity is 7.93 gallons. Customer reviews: Customers love this table. One customer reported that the cooler held a 16 lb bag of ice and the drinks remained cool for 12 hours. Comments included, "Great buy." "Easy to assemble and looks great." Lift the table top and use the cooler and table for serving foods. Set between two lounge chairs or by the door leading onto the patio. The Little Chiller Party Table is made of high-density polyethylene top that can be filled with ice, drinks and bowls/trays of food. 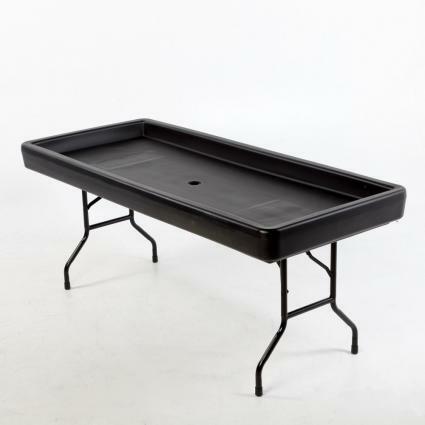 Supported by powder-coated steel legs, the table can support up to 300 lbs and features a dual-stage drain. Customer reviews: One customer plans to purchase a second table, and another stated it looked "really professional". Some of the comments include, "Great table! You can actually attach a garden hose to the drain" and "This table is very nice." Wrap faux garlands of ivy and/or flowers around the table legs. Set a vase or two of colorful flowers in the ice to create a festive look. You may prefer to set several pots of varying heights filled with flowers underneath the table. Tie a few helium-filled balloons to the back legs with colorful streamers for another layer of decorative fun. Once you've inserted your drinks into the cooler ice bed, sprinkle colorful metallic confetti over it to keep the gala fun going. A unique serving table becomes more than a simple convenience for hosting a patio party or dinner; it can also be a conversation piece. The Crosley Palm Harbor Outdoor Wicker Butler Tray table is made of durable resin wicker and sits on a strong powder-coated steel base. This side table can be used to serve drinks and/or food. The tray is removable and has handles, allowing it to be filled inside the house and carried out to the patio. The table has a 90-day manufacturer's warranty. Customer reviews: Customers are pleased with the table and find it very convenient. Some comments include, "Sturdy" and "It's well built." Set this tray table beside a dining table and chairs or a conversation seating area. If you have an outdoor bar, set it nearby or create a second beverage/food area across from the bar to better serve guests. Pebble Lane Living shows off with this black Outdoor Aluminum Riviera Console Patio Table made of rustproof and weather -resistant aluminum. The top and bottom shelves are made of tempered glass tinted black. Customer reviews: Customers are pleased with their find. Some comments include, "The bottom shelf is perfect for beverage bottles", "Beautiful simple design", and "Very nice, but not very heavy." 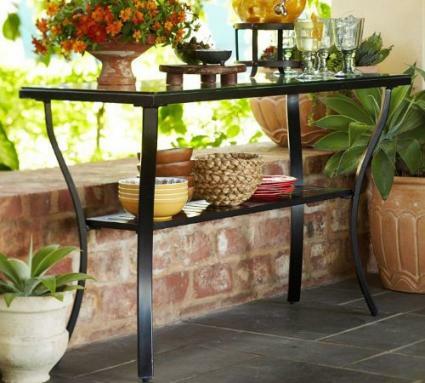 This table style is great for a Mediterranean, Southwest or other style that incorporates wrought iron. Add a pair of wrought iron candle holders that are different heights. Choose column candles and go with a color that repeats one of the colors in the rug, cushions or pillows to tie it further with the existing patio decor. 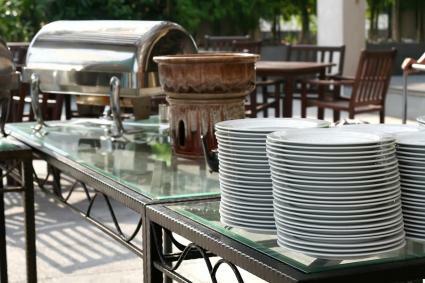 There are many types of serving tables to use on your patio as a food and beverage station. Decide which functions you need, such a built-in cooler or bottom shelves and then select one that will go with your other patio furniture. Place your table in an area on your patio that is convenient for guests to access, but isn't in the main path of people moving in and out of your home.